1. Add the granulated sugar and lemon zest to the hot coffee. Stir to help the sugar dissolve, then leave to sit for about 10 minutes. Pour the coffee through a paper filter or a sieve lined with a piece of kitchen paper or new kitchen cloth. Allow the coffee to cool completely then add the lemon juice. Add more lemon or sugar to taste (it will be quite sweet but remember that freezing mutes flavours). 2. Pour the mixture into a large shallow dish (I use a metal baking tin), cover with cling film and put in the freezer. After about 40 minutes the mixture should have started to freeze around the edges. Stir with a fork, mixing the frozen bits with the central pool of coffee. Continue to break up the frozen mixture every 45 minutes or so until you have something that looks like coarse snow. 3. Whip the cream and add a little icing sugar (don’t make the cream too sweet). 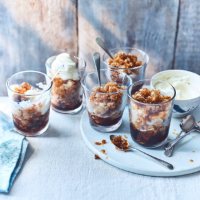 Spoon the granita into glasses. Top with dollops of the cream and serve immediately.